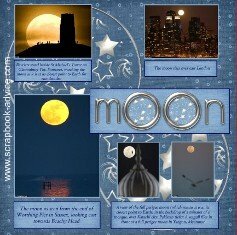 I scrapbooked this Layout of the Perigee Super Moon from an article I printed from www.dailymail.co.uk. Check out the article to see the stunning photos better and see the credits for the photos. While I often like to Scrapbook an occasional current event for my Chronological Scrapbook Albums, just to put events into perspective, this one was particularly interesting to me as I have often taken "Moon Shots" to enhance the mood of my outdoor evening events. I only did 2 layouts with the printed article, cutting and matting the photos and adding them to the top of some digital background paper I printed from Heritage Makers. Journaling was the exact text from the Dailymail Article and the photos still have the copyright on them which I feel is important. These layouts are combined Digital & Traditional Scrapbooking. The background paper with the subtle print of small circles and dots in a lighter blue and the lighter blue paper used for mattes was from my Heritage Makers Art Work from my Digital Scrapbook Site. The Title was made from HM Art Work also - lettering was found under a search for "Silver". Also found under silver were the large silver circle & the stars and swirls images that I used as a print on top of the background paper. I printed these myself on my own computer - not something I usually do, but I wanted to see how it worked. When I printed the article, I used a dark blue color font for the text to go with the background paper and I printed it all out on a transparency. I spaced the text and adjusted the font size to fit into the blue captioned areas on my newly printed paper. I cut the photos and matted them on an extra copy of the light blue paper. I matted the light blue journaling blocks on an extra copy of the dark blue paper. 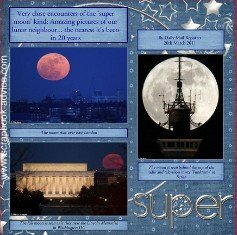 I hope this short little example of the Perigee Super Moon and the process of combined Digital & Traditional Scrapbooking has given you some ideas for your own scrapbooks.